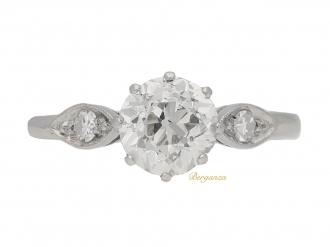 Berganza jewellers are a family-run jewellers based in Hatton Garden, London. There staff are knowledgeable and experienced in selling unique antique and vintage jewelry. There you are sure to find a range of unusual rings and jewelry due to there wide collection of antique and vintage pieces. They supply only the finest quality pieces available, and ensure all their gems are natural untreated stones without enhancements. Basically, when you purchase a piece of fine vintage jewellery from Berganza, you are investing in a rarity. If you are on the look out for an an antique engagement ring than Berganza is the place for you. 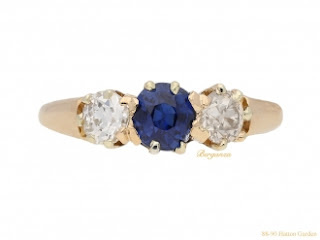 They have such a wide range of different antique and vintage rings and there website showcases some of the most beautiful. If you see an item that you are interested in than you will want to snap it up asap. With each item being unique you will find that items are likely to sell quickly. The greater the interest in an item the quicker it will sell. Do you love vintage and antique jewelry? Do you own any awesome pieces? What do you think of my two picks? I'd love to know as usual comment below. I love vintage jewellery, especially if there is a story attached to it. Vintage jewellery is so cool, you've got some good picks here! These are such beautiful rings. I love vintage jewellery. I don't wear much jewellery but I love unique pieces with stories behind them! Vintage jewellery is always my favourite as it's usually a one off! Vintage jewelry is nice! I love the bottom ring. Lovely choices. My wedding and engagement rings are both simple but gorgeous platinum. Very lucky! I found out about this shop last week and it's true that it's beautiful. Although £103,000 for a diamond ring was off-budget for me! Wow, I'd never even realised there were places that sold rings from the medieval period or even earlier! I'm going to have to save up to buy one of those some day. Wow how pretty. I love Hatton gardens they have so many great jewellers there. I recently heard about Berganza, they have so beautiful pieces! My mummy loves costume jewellery as its much cheaper! She loves digging through Carboot lots and finding treasure....who knows she could stumble on a real antique one day! I love vintage jewellery and the photos of the rings here are just beautiful.